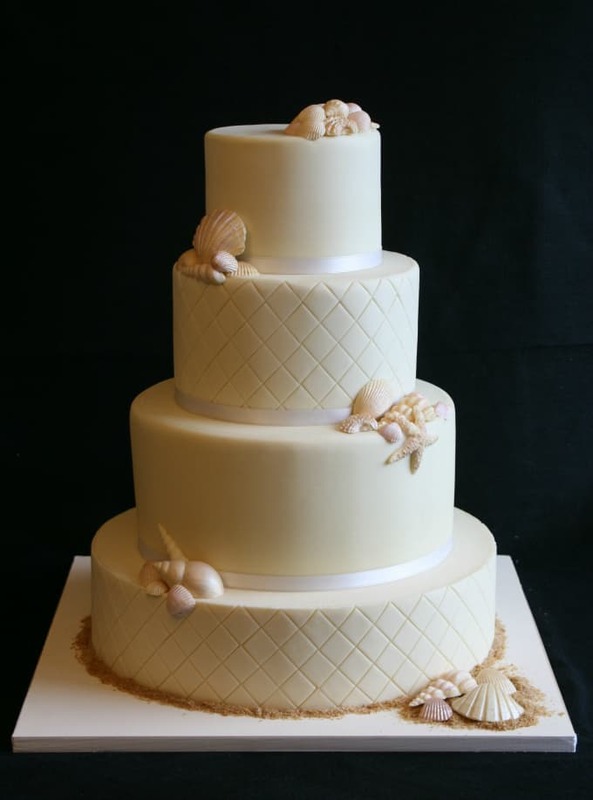 The beach theme wedding cakes on this page are what I consider pure works of art. I’ve gone on the hunt for beach wedding cake designs that are sleek, classy, modern and unique but still fun! And I’ll share them all with you on photo galleries throughout this site. 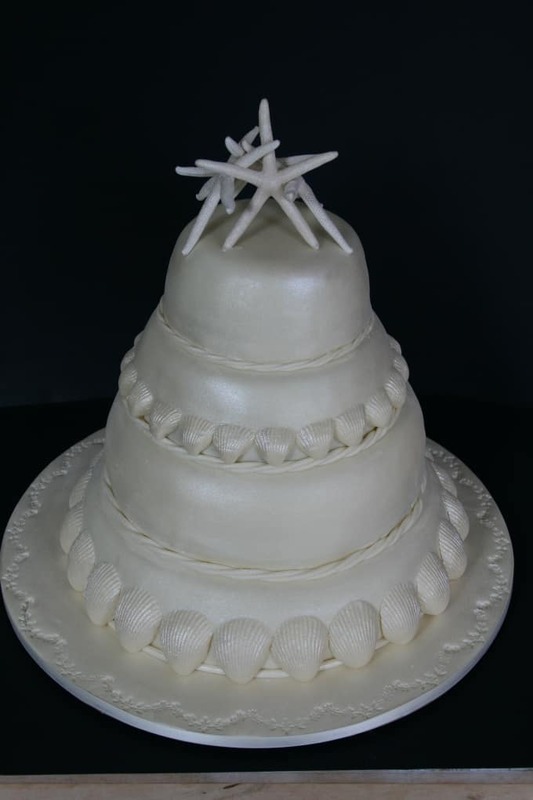 If you find one that you love, just print it or forward the link to your baker to give them an idea of the theme you’d like for your very own beach wedding cake design. 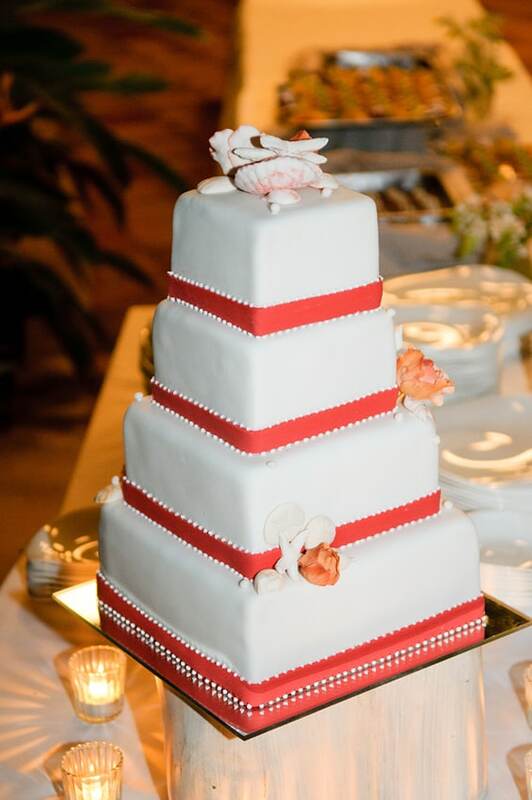 This gorgeous cake is made with white fondant and accented with a coral ribbon at the base of each tier. There are just enough delicate seashells, sand dollars, and flowers to weave in the beach theme without going too over the top. 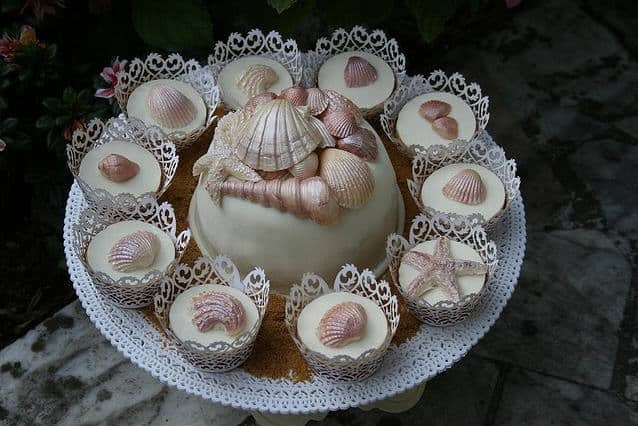 The next 6 beach theme wedding cakes in this post were all baked and decorated by the fabulous Torte Di Toni who happens to be located in Italy, so make sure you check her out if by any chance you’re tying the knot near Tuscany–she’s absolutely awesome in every way! Regardless of where you’re getting married, you can still draw inspiration from each of the beach theme wedding cakes featured here! If you thought that white was the default color for your cake, this is a gorgeous example of how you can use a bright color without sacrificing style or class. 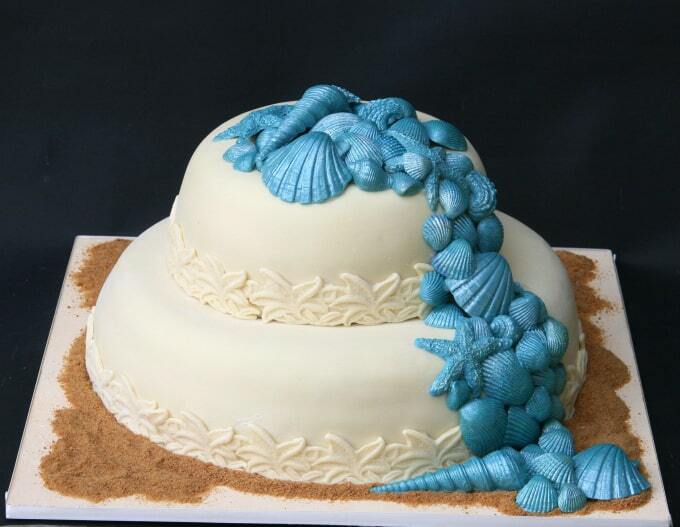 Decorated with ocean blue fondant and just a few neutral colored seashells scattered throughout, it looks almost too beautiful to cut into. You might not think blue seashells sound all that great in theory, but the end result can be pure brilliance! 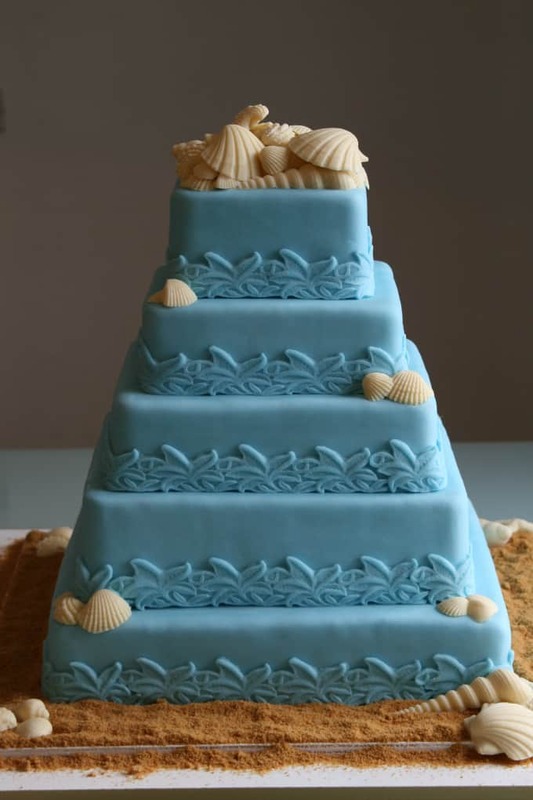 This is a smaller two tiered beach theme wedding cake which is just perfect for a smaller intimate ceremony. The seashells were made of fondant and painted with blue & pearl luster to give it that beautiful and shimmery look. Don’t you just love everything about this beach theme wedding cake? If you look closely enough, you’ll notice how each seashell has just a hint of shimmery copper! It’s a small detail but it really takes this cake to another level of Ah-MAZING! This design is brilliant in its simplicity! The cake is similar to the one pictured above but this one is sleeker and has a more modern feel. The subtle quilting detail, the satin ribbon – everything about it is just gorgeous! 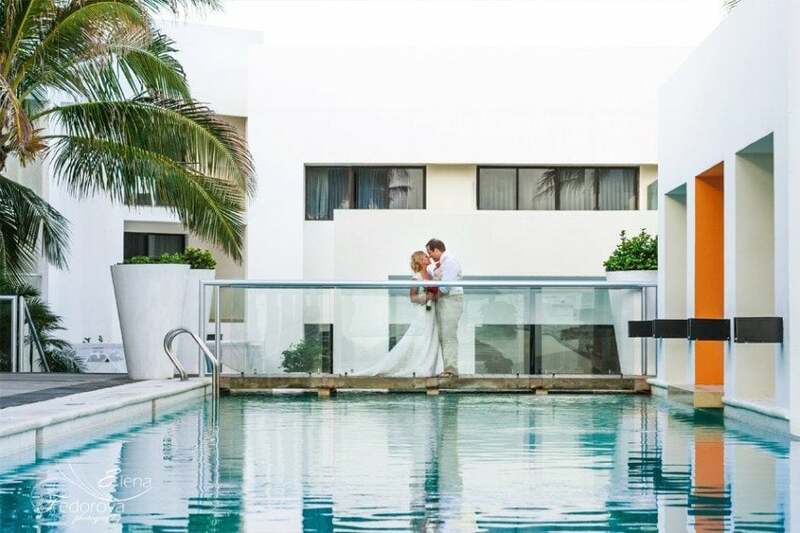 White can seem so blah in a traditional setting but when you have the turquoise ocean, blue sky and towering green palm trees as your background, white can really look chic, modern and classy. 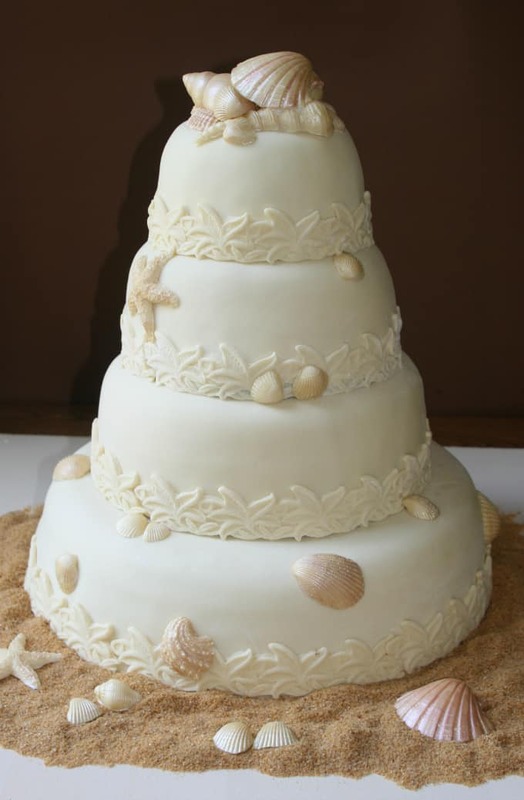 If that’s the theme you’re going for, there are some gorgeous beach themed wedding cakes to fit the bill. This happens to be one of my all time favorites. 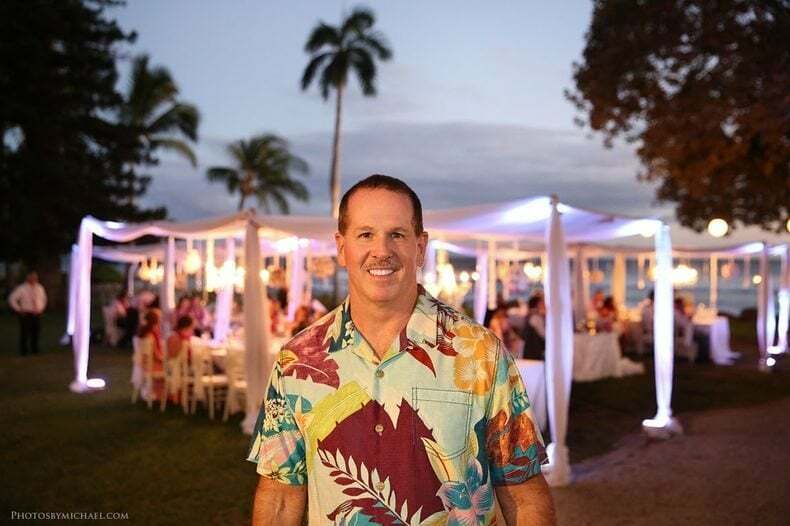 It’s common for beach and destination weddings to be smaller and more intimate, which opens up a huge problem – what do you do with all that leftover cake? 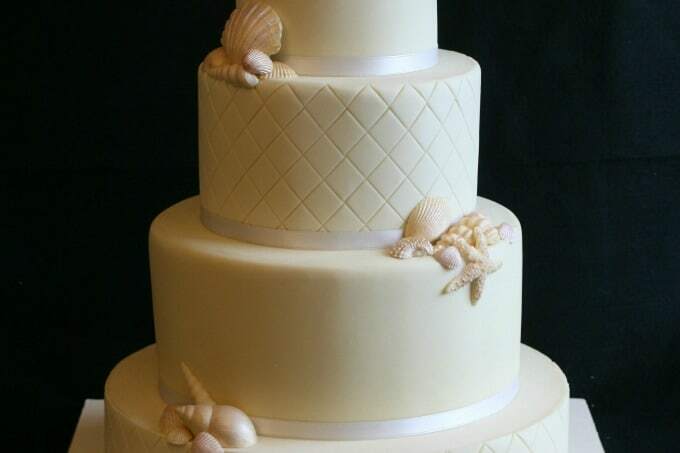 Petite beach wedding cakes and cupcakes like the ones pictured below are an AWESOME solution! Cupackes and petit cakes are a growing trend, that can save you lots of money. I love how there’s a different seashell and starfish on top of each cupcake.